Well it’s 2017, and time to face the fact that consumers are barraged with ads and content more than ever, and people are learning to tune out marketing. But as humans, we have always enjoyed exchanging stories with other people. Whether it’s telling them, listening, watching them unfold, or writing, stories have been a timeless part of our culture. That’s the stuff we are all about here at Genius House, chronicling and spotlighting through video and social media. We capture different brands’ stories through video as well as share our own narrative with behind the scenes posts and hopefully witty captions. After spending some time pondering this fact, an idea was born. And with that, the inspiration for the new Genius House blog has now begun. Moving forward, this space will be dedicated to communicating stories told with personality. Folks may or may not want to read our stories, but I should add that writing for SEO is trending toward a more human approach, and also this writing style is much more fun for me. A young Adam (GHM Co-Founder) and his energetic best friend, Grant (now a Sound Engineer + GHM partner), had been dabbling in production for years. To clarify: they loved to make weird, hilarious stuff with buddies. Parties were often transformed into productions, with friends assigned as actors and plots making less sense as the night progressed. They shot with camcorders and taught themselves how to edit, all while having so. much. fun, the way a craft should develop. Years passed, and Adam and Grant’s “films”, such as “Gnome’s Grove” and non-sensical horror movie previews were piling up and the need for a production company became a topic of comedic conversation. They constantly brainstormed, mostly by mocking the existing egotistic sounding companies such as Legendary Diamond Dreamcam Wizard House Productions and Goldenboy SparkleHouse Pictures. (Those are completely made up, but you get it). 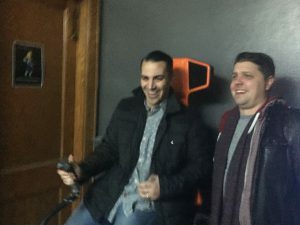 Adam & Grant, December 2016 -Still goofin’ with video games in their late 30’s. Years later, when we started Genius House Media, we asked Grant for permission to use the Genius House name and he was all about it, especially knowing we would keep him involved. Grant recently told us that he is proud that we could continue the life of an “inside joke amongst close friends that spoke to making a great product while capturing the essence of our sense of humor.” Well said, Einstein Grant.